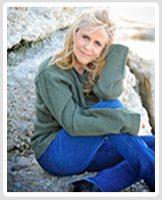 ﻿ Bonnie Trachtenberg » Blog Archive » Learn The Fine Art of Delusional Thinking! Learn The Fine Art of Delusional Thinking! Okay, so my third novel is taking a bit longer to write than I hoped (I hate when my books don’t write themselves!) so I decided to release a book in the interim. It’s one that I wrote a few years ago and always wanted to publish. Unfortunately, I never seemed to find the time once my first novel, Wedlocked, took off. I felt bad about ignoring this little baby of mine, so last month, when it called out to me for attention, I decided it was high time I finally shared it with the world. And so, today I present The Fine Art of Delusional Thinking: Happiness Means Never Having to Have a Reality Check. It is a funny, satirical book that teaches readers how to delude themselves to a happier life. With the explosion of books on the subjects of creative visualization, now more often called the laws of attraction, I thought a fun little parody was in order. As I reflected on all the years I spent floating through life in a delusional haze, I knew I was the perfect person to write it. Talk about books that write themselves—this one practically did! That’s probably because during my ten-year stint in Los Angeles, I packed a wealth of wild experiences, colorful people, and nutty behavior patterns into my daily life, all of which helped to inspire this book. I think it will appeal to an awful lot of people, because aren’t we all a little delusional sometimes? Enjoy! Have you always wished you had a glamorous career? A spouse who worships you? An awesome set of wheels? A fantabulous social life? With The Fine Art of Delusional Thinking, all these goals can be within your grasp. You’ll never again fret about your weight, your monthly bills, your love life, or your bank account. This witty and concise how-to book from best-selling author Bonnie Trachtenberg teaches you everything you’ll need to know to turn your humdrum existence into a lifestyle others will envy. So delude your way to a happy life—with help from an expert. 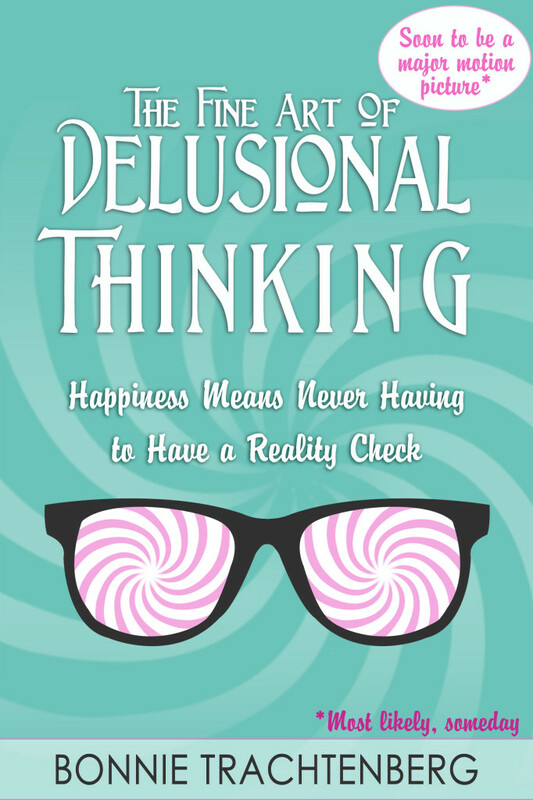 You can begin the journey of deluding your way to a happier life by studying and implementing the basic principles of the delusional thought process. Incorporate them into your daily life. Never stray from them lest you reap the wrath of resistance: a crude and devastating reality check. 1. Turn a deaf ear to “practical” advice and criticism. We all know them too well—the Naysayers. They dictate, advocate, and pontificate. They’ll beseech, belabor, and belittle you. They’re those vexing meddlers who think their all-knowing cynicism is the key to improving your life. Don’t fall prey to their prying antics. They don’t know better than you. Their advice is geared to bring you down to the depressing depths they’ve established as their own reality. They aim to burst your blissful bubble, and thereby validate their own depressing lives. Take Jason, for instance. He always heeded the “good sense” his parents painstakingly instilled in him. When he said he wanted to be a performance artist, they sent him to law school. When he said he wanted to move to a commune and live off the land, they convinced him to get married. When he told them he wanted dogs and cats instead of children, they goaded him into starting a family. And then there’s Elizabeth, a thirty-three-year-old legal secretary, who dreamed of quitting her boring job, packing up her belongings, and moving out to The Coast. She had always heard Hollywood calling her name and she wanted to claim her glamorous life before it passed her by. She didn’t have a job, an apartment, or friends out West, but she decided to follow in the footsteps of the brave pioneers and let adventure blaze the path for her. Her family and friends urged her to come to her senses and get a grip on reality. How could she consider such an impulsive move without any definitive plan? They lectured and badgered, but they couldn’t convince her she was making the biggest mistake of her life. They tried to scare her, to shame her, and even to mock her “silly notions,” but Elizabeth managed to hold a tenuous grip on her dream. When all else failed, the group got together and performed an intervention. They cornered her, locked her in her room, and pestered her until she finally broke. Anxiety and fear overtook poor Elizabeth and drove her back to her crappy job, her head hung in shame. Don’t let anyone break you! The next time you are confronted with harsh opinions and admonitions that declare your blissful outlook to be naïve or preposterous, stare blankly at your accuser and IGNORE EVERY WORD. Think about other things as you drown out their negativity. Imagine the Publishers Clearing House people have just knocked on your door with your check and some colorful balloons. Daydream about the moment Martin Scorsese spots you having lunch in a downtown eatery and begs you to star in his next film. These images, and others like them, will help muffle the irksome voices that strive to destroy your delusional pleasures. Find out my other four fundamentals of fantasy and much more HERE!